It is with a heavy heart that I criticize Chinese food here in the United States. Frankly, I used to live on this stuff until a doctor woke me up. That doctor, Dr. Chan, is Chinese! He noticed a jump in my weight and asked me about my diet. Proudly, I shared that I ate lots of vegetables because I loved Chinese food. "Don't you realize how much oil is in those vegetables? They deep fry them to make them bright and crunchy! ", said a frustrated Dr. Chan. He then explained that he doesn't eat take-out Chinese food, and referred me to his favorite store, Trader Joe's, for healthier alternatives. A vegetable dish in a U.S. Chinese restaurant can include 900 calories and 2,200 mg of sodium. Which is really sad because vegetables are good for you, but not when you pour oil and salt on them. Here is a great guide to the calorie amounts of your favorite dishes - Chinese Restaurant Food. What is a Chinese food lover to do? Well, I think it is possible to make great tasting vegetables with Asian flavors without the oil! I have done some experimenting and you don't need the oil to have them taste as good (or better) than your favorite Chinese restaurant. The key is to have the sauces that they use on hand to flavor your dish. I have found ALL of the sauces that I need at my local grocery store in the Asian section (I didn't even have to go to an Asian market!). So, what did I buy? I chose two sauces, Oyster Sauce and Fish Sauce. Oyster sauce has an oyster extract with salt and sugar. Fish sauce is very similar to Worcestershire sauce, which has an extract of anchovies. The fish sauce smells like dirty socks and it is a very strong flavoring agent, but you will be amazed at how good it tastes when added to the vegetables. The sodium here is still pretty high because oyster sauce is 930 mg of sodium for one tablespoon. This completely shocked me, as I hadn't looked at the nutrition facts until I decided to share this recipe on Snack Girl. The entire recipe has 180 calories (4 Points+) and would make a great meal with some of your favorite rice. Just don't add any more salt to it because it is 1,200 mg of sodium for the entire dish. I was able to slash the oil and salt, but it is still pretty high for those concerned with heart disease. This is great hot, cold, or room temperature and it would be a fantastic snack to put in a container and take with you to work, etc. Have you "made over" Chinese food? Please share. Mix sugar, fish sauce, and oyster sauce into a small bowl and set aside. Heat oil in saute pan until hot. Add garlic and cook for 15 seconds. Add green beans and stir until desired doneness. I sometimes add 1/4 cup water to the pan to steam them along. When cooked, mix in sauce. Enjoy! So, basically those of us who are on a low sodium eating plan due to high blood pressure just can't have Chinese food period. That stinks because I love it. I haven't had it since October, and probably never will. @Cathy - saltiness does seem to be a really large component of Asian flavors - let me look into it to see what I can figure out. Hang in there! My old WW trick for eating Chinese food was to order my favorite saucy item (Chicken & Cashew nuts is one) and an order of steamed veggies. I would mix about 1 cup of the saucy food to the steamed veggies and enjoy! I got the same flavor but with way more yummy veggies (instead of rice). Also, the Weight Watchers Take Out Tonight book has some great Chinese stir fry recipes (not sure of sodium content though). I would use a tiny bit of extra virgin olive oil. It still has fats but they're good fats. EVOO has a lot of flavor too. Or you could add other spices without the salt. I guess that maybe would make it less like Chinese food... but it's still a good way to make vegetables delicious. Yeah, 1,200mg is a non starter to someone with high blood pressure. The recommendation is no more than 1500mg a day for those that are salt sensitive and no more than 2,300 for everyone else so this much salt isn't a good idea on a regular basis for anyone really. I don't know about oyster & fish sauce but I know a lot of sauces (soy, tamari, worcestershire, etc.) come in low salt versions that are at least a little bit better. I'm able to use them sparingly and still stay within my salt limits most of the time. I also beat some eggs and cook them in a fry pan(with no fat butter spray) then cut into strips and add to rice/veggie mix. I usually make this dish when I have leftover BBQ pork tenderloin and throw that in as well, tastes great! Freezes well too, for leftovers. 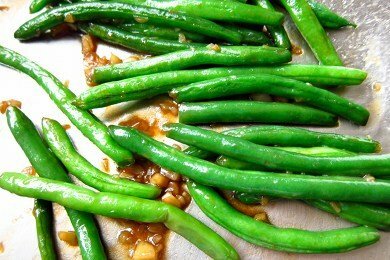 I hate green beans.. can you use mixed veggies? Broccoli, corn, carrots? You can make this dish with any kind of leafy green such as spinach, kale, chard, bok choy, etc. I like to cut the greens into 1/2 inch strips before cooking. I noticed when I was younger that my feet and fingers became swollen the next day after eating Chinese food. It was from the MSG they used when cooking. I also swole up from Cheetos, Doritos, Fritos, boxed/canned/frozen foods. It's the salt content. I loved all the above "food items" but I'd rather wake up feeling good and NOT swollen so, I took those "foods" from my diet about 25 years ago and haven't looked back. People often talk of "missing" certaing foods or "feeling deprived." I would rather miss those foods than be swollen, have high blood pressure and bloating. Eden Foods - Organic Shiro Miso is 330 mg sodium per Tablespoon. This can be substituted for Soy in many Chinese recipes. Garlic and ginger are complimentary flavors to the miso and you should be able to turn out something flavorful for less sodium. Of course, you'll have to play around with it some. Nancy- that us a great idea thank you!!! Hi. I know that too much sodium is not that great for you but I wanted to pass along something about high blood pressure and sodium. I used to have high blood pressure, I got headaches all the time and had 160/100 blood pressure. I didn't reduce sodium really (although I do still have to avoid decongestants like sudafed) but I normalized my blood pressure by dropping 30 pounds and getting my BMI below 23 (which is the top BMI for Asians like above 25 is overweight for Americans.) And I'm Asian American. I feel better thinner and have normal blood pressure. So before you abandon salt, it may be easier to drop that extra 10, 20, or 30 pounds if you're not already thin, than to cut down on salt! Chinese restaurants (not the fast food ones) understand what low sodium means and will prepare your meal as such if you request it. I find that to be true with any diet restrictions when you go to a Chinese restaurant where there are "real" chefs. Additionally, many of their dishes are not prepared by frying. Coming from a Vietnamese family (who has a slight touch of Chinese roots) makes this dish about once in 2 weeks. It is really good, but my family, sadly, uses about 1/4 C of oil. I need to persuade them to use less. Use healthier oils; coconut oil is the best choice when stir frying. Canola oil and vegetable oil are probably the worst choices. I have a Teriyaki sauce recipe that I love. Although it uses soy sauce, you only have to use a little to add some flavor, and the recipe is several servings. I save what I don't use, and add water if it gets too thick. Mix all ingredients but cornstarch and cold water, and heat. Mix cornstarch and cold water until dissolved. Add to other mixture and heat until sauce thickens. Most people don't realize that when you go to a Chinese food restaurant, you can ask for things like no MSG, light oil, etc. Since wok dishes are made when you order them ,there is some flexibility. I order light oil and it is definitely better. I heard someone a few weeks ago order something that is typically made with dark meat chicken "all white". It never hurts to ask.